These two items appeared separately in the original version of the Around Naples Encyclopedia on the dates indicated and have been consolidated here onto a single page. Additionally, there is another item on The Egg Castle by another author at this link. Number 1, the Egg Castle is directly below; number 2, Neapolitan Legends is farther down. The Castel dell'Ovo (the Egg Castle) is what you first notice as you stroll along the seaside Villa Comunale, the Communal Gardens, in Naples. It is a fortress built on the small island of Megaride, just off the Santa Lucia section of the city. Here, legend has it, is where the siren Parthenope washed ashore after throwing herself into the sea when her song failed to bewitch Ulysses. Less mythologically, here is where the Greeks from Cuma to the north first settled the bay of Naples in the fifth century bc. Centuries later, the island became the home of the last Roman emperor, exiled here in 476 A.D. after the empire was overrun by the Goths. The fortress that you now see dates back "only" about a thousand years and is essentially the result of Norman and Angevin construction done in the Middle Ages. It was then that the strange legend arose that a thousand years earlier, the poet Virgil had hidden an egg in the castle, the fate of which would parallel the fate of Naples, itself. As long as the egg remained intact, the city would be spared destruction. Thus the unusual name, the Castel dell'Ovo, or "Egg Castle". The egg, of course, is in many contexts —from pre-Christian ones to Augustine's commentary on Luke to Bosch's "The Garden of Earthly Delights" and even to the popular use of the "Easter egg"— a symbol of life, resurrection and hope. Thus, the broken egg stands for spiritual death, and, thus, at least once in the Middle Ages, a Neapolitan monarch had to go out and assure the people that the egg had not broken. It was intact —and Naples was safe. 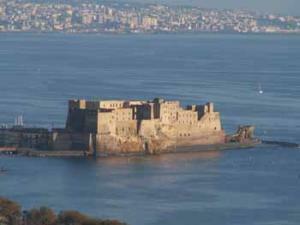 Yesterday, I tidied up a few loose ends in my mind concerning the Castel dell'Ovo (Egg Castle) in Naples. First of all, on the ramparts are some cannon positioned such that they would fire in at the city and not out to sea (as one might expect in a fortress meant to protect against attack by naval forces). It turns out that the ones you see up there today were put there for ornamentation, having been recovered from the bottom of the bay of Naples at a point where some ship went to a watery grave centuries ago. Yet, tales of guns from the castle taking pot-shots at the city are not entirely false. Around the year 1500, when the French and Spanish were disputing the future of Naples, the Spanish parked their artillery on the height of Mount Echia, the cliff directly across from the small island of Megaride (where the Egg Castle is situated)—only about 200-300 yards as the crow flies—and shelled the Angevin French in the castle, who, of course, returned fire. If you could fire those cannon today would you would take out the row of luxury hotels that have sprouted like poisonous mushrooms since the new seaside road was built a century ago. They are so tall that they obscure the original cliff face of Mount Echia, the height that was so enchantingly beautiful 2,500 years ago that the Greeks chose it for their city, Parthenope. One barrage would do it (see photo, above). Virgil is said to have taken the first egg laid by a hen, put it in a glass amphora, and placed that in a finely wrought metal cage suspended from a beam braced against the walls of a small secret chamber built especially for that purpose within the castle. As long as the egg remained intact, the city was safe. Virgil, thus, joins the list of select protectors of the city, including the original siren, Parthenope and the more recent Christian protector, the patron saint of Naples, San Gennaro —St. Januarius. Interestingly, even if there were an egg in that castle, it would be a second generation one. At the time of Queen Joan I of Naples (1326-82) —shortly after the Chronicle of Parthenope was written— a devastating storm wrecked much of the Castel dell'Ovo, even destroying the natural arch that joined the two parts of the island. Joan had to ensure the population that it was because the egg had broken, but that she had personally gone through the same magic ritual as Virgil, putting a second protective egg in place in the same spot. The populace was calmed.